Lack of power. Not everyone has Fabian Cacellara’s legs. Heck most of America has pale pudgy pork chops masquerading as legs. 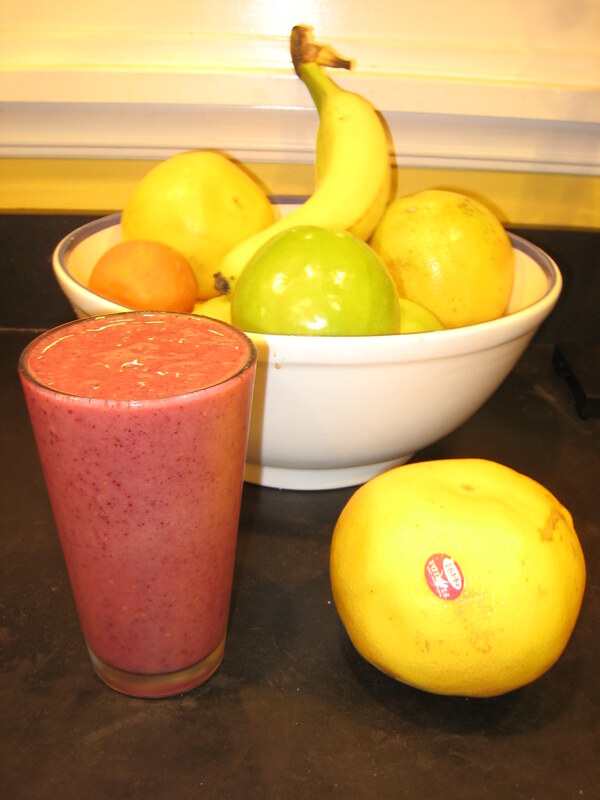 You just can’t count on hours of high-watt output from your would-be smoothie producers. 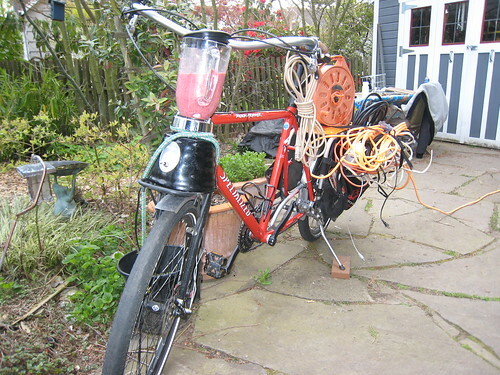 Wouldn’t it be great if the DIY bike blender had a way to run for hours with little operator effort? Low-Technology: While the typical bike blender uses a rudimentary-but-adequate gear-and-friction mechanism to provide its ice-crushing prowess, I decided to go with something a big higher tech. I mean, I’m a man in the second decade of the 21st Century. I watch YouTube and have a cellular phone. Surely there’s a better way to mash fruit than friction and spinning tires. Lack of Portability: Instead of having the blender tethered to the Snapdeck, as required by the aforementioned friction mechanism, wouldn’t it be great if you can place the unit where you want, such as the, front rack, snapdeck, custom mount, or even table? With my all-new design, those shortcomings are a thing of the past. 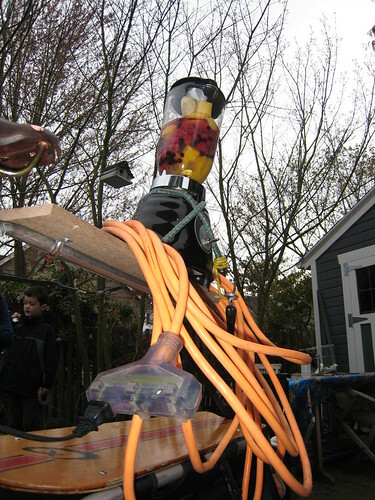 Instead, you and your VeloMix can concentrate on cranking out the best mobile smoothies on your block. And since it’s a mobile blender, your ability to make delicious frozen beverages on the go is only limited by the cord you carry. To increase your range, merely add more cords. You’ll find that the Xtracycle’s generous hauling capacity means more cords are no problem! With just a little effort (and an assload of cord) you’ll find yourself the life of the party almost half a block from your house! Sure, such inventing took a lot of effort on this first day April, but these smiling faces make it worth it in the end! And that’s just version 1.0. A tinkerer like me always has something up his sleeve. Hmmmm, I wonder how much ice-crushing madness that 2-stroke from motorized bike could bring to the party? 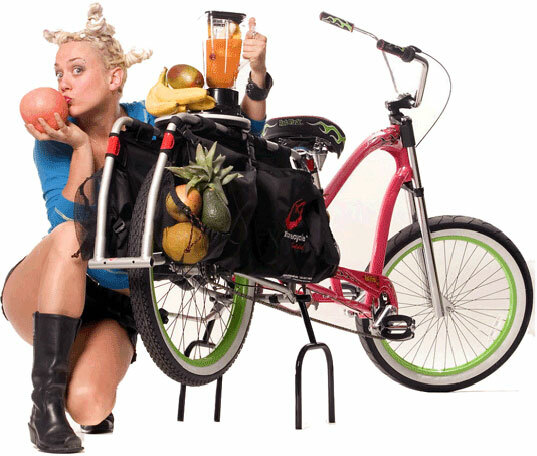 NOTE – seriously, if you are lookin’ for a blender, head on over to Rock the Bike and buy one. They’re good folks doing business right. This entry was posted in bikes, consumerism, extravehicular activities and tagged "bike blender", bikes, blender, smoothie, xtracycle. Bookmark the permalink. My compliments to the inventors! 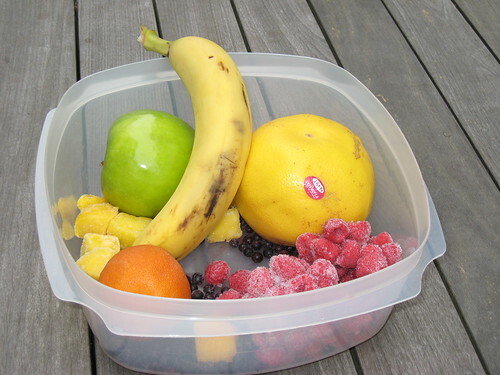 Looks like you might have tired your arms out using a manual knife to cut up all that fruit. Maybe a chainsaw? Portable, and more safety features than a knife. I have followed all of your directions, but the blender doesn’t turn on. Does the cord(s) have to be connected to anything specific? @Julian: Don’t worry that was just prop fruit. Originally I had planned on doing prep work with my grandparents’ electric knife (it was always a treat when they brought that out at Thanksgiving to saw up the turkey), but all my outlets were full. So I borrowed the neighbors Suburban and roared off to Trader Joes to get some pre-cut fixings. @Max. Sorry for the confusion. Rope is not synonymous with cord in this case, unless said rope is very, very wet. Even still you’d have a hard time getting rope thin enough to shove into the little slots on the outlet (do not try this at home). I’m not sure what comes out of those slots or where it comes from, but dang it makes the blender hum like magic! oh, and @Max. That’s great news about the DC bike building. Is that the one where Marion Berry, former mayor and now UCI level 2-certified technician, will be spinning wrenches on “celebrity-mechanic Thursdays”? I think I read something about that in the latest Bicycling magazine (you know, the one with really fit, strobe-lit rider on the $14k bike on the cover? yeah? that one.). No Tim, that article was in a previous issue-the one with the $16,000 bike with color-coordinated rider (also strobe lit on seamless backround). The issue also had the article “100 ways to shave five grams now!”, and a funny piece about how some wacky guy in Anywhere, USA carries his two kids on the back of his bike! Crazy good stuff. Like we’re in China or something!! Awesome. I was considering following the plans for a velo-blender in the book “The Human Powered Home” but yours seems much simpler. I wonder how much cord it will take me to reach all the way to Burning Man? @bikejuju: Isn’t burning man just a state of mind? Couldn’t you be happy with the typical driveway length cord while you looked at flickr photos of _other_ people’s adventures? Failing that, I am developing plans for a tow-behind “liquid fuel” (almost like water, it’s so plentiful!) 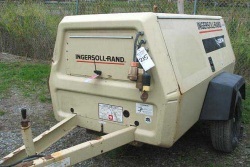 unit that facilitates a similar “instant” power output, but with much simpler cord requirements. Like any newly developed product, I’ll probably continue to improve it. But, if I may toot my own horn, I can’t imagine any shortcomings at all with this new “liquid fuel” system.